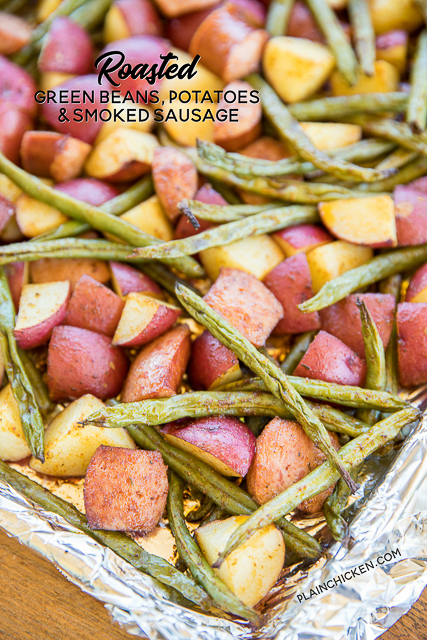 These Roasted Roasted Green Beans, Potatoes and Smoked Sausage can be a main dish or side dish. Either way, this is a super easy recipe that everyone will enjoy!!! There are only 5 ingredients and it is ready in about 40 minutes. I used smoked turkey sausage in this recipe. We like it and it saves a bunch of calories. If you aren't a fan of smoked turkey sausage, you can use regular smoked sausage. It will taste just as good, if not better! I just tossed everything together and let it all bake the same amount of time. If you like your green beans a little crispier, add them to the pan with about 20 minutes left to bake. This recipe uses Cajun/Creole Seasoning. I buy it in the spice section at the grocery store. My usual brands are Tony Chachere or Slap Ya Mama. Walmart and most grocery stores carry one or both. Penzy's also sells cajun seasoning. Preheat oven to 425ºF. Line a rimmed baking sheet with foil. 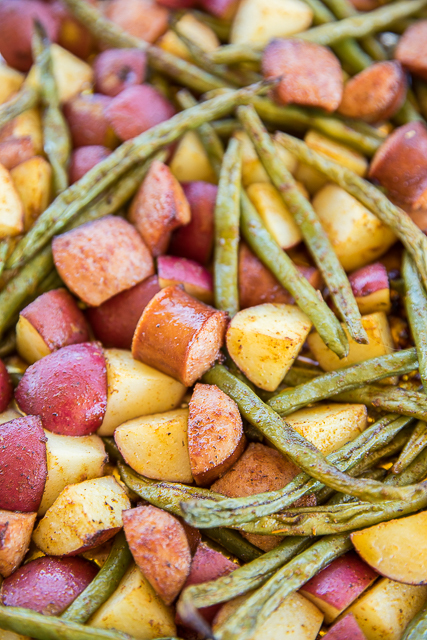 Add sausage, potatoes and green beans to a large bowl. Sprinkle with Cajun/Creole Seasoning and toss. Spread seasoned sausage, potatoes and green beans on prepared pan. 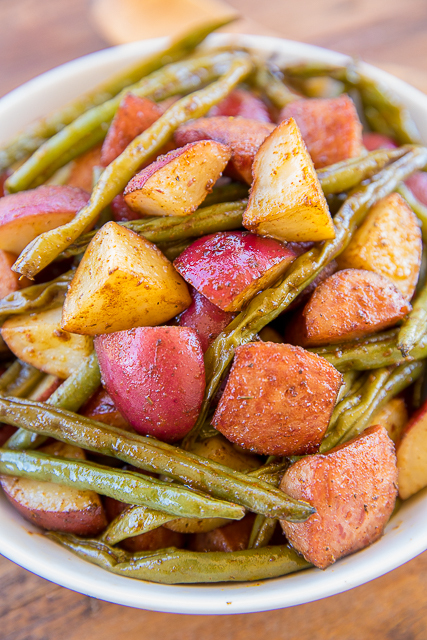 If you want crisper green beans, add them with 20 minutes left to bake. Made this as a side to chicken thighs for dinner last night, it was really good. I went with 2T of Creole seasoning and it was just a tad too much, I'll cut back next time. The chicken was in the oven at the same time, so the cooking temp and time was adjusted to that recipe, but worked great for this as well. Thank you for sharing.